»Our Faith»What if Jesus were on Twitter? My friend told me about a status update she saw recently where someone loudly proclaimed they aren’t ashamed of their beliefs and anyone who doesn’t like that can just unfriend them now. I’m all for standing up for your beliefs, but if your faith is so strong, do you need to aggressively proclaim it and shun anyone who doesn’t agree? Personally, I welcome people who don’t share my beliefs. I’ve gotten into many deep conversations with people who completely disagree with me but who respect me because I’m willing to have a relationship with them and share with them my thoughts, not just shout at them that they’re wrong and if they disagree they can unfriend me. It reminds me of those memes that say “Share if you love Jesus” or “Keep scrolling if your faith isn’t your top priority” or other such messages. Like my faith and my depth of love for Jesus is dependent on me clicking “like” on a poorly-spelled homemade meme. Faith is something that should be so integral in our lives that it’s obvious in all we do and say. It should come out naturally when we build relationships with people, and it should give us the opportunity to share with people why we have hope. We shouldn’t need to prove it by clicking on a meme or yell at people who don’t share our beliefs in order to get the point across. So, back to my original question, what if Jesus were on Twitter? Would he demand you retweet of all of His posts to prove you really love Him? 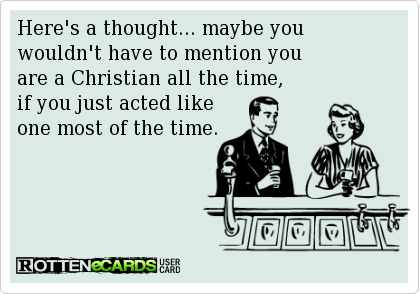 Or would He say “Love your enemies #unconditionallove”? Would He tell you to unfriend anyone who didn’t agree with you or would He say “Do good to those who persecute you #showmylove”? Would he say “Unfriend me now if you’re not prepared to go with me to the cross #fairweatherfriends” or would it be more like “I’ll forgive you no matter what #Iamwithyoualways”? Obviously I can’t claim to know what Jesus would tweet or how He would respond to social media, but I think it’s good to consider, before you post judgmental, passive-aggressive, or inane and trite things, to consider if you’re sharing your faith or if you’re shoving it at people, if you’re standing up for your faith or if you’re pushing away people who might be seeking but don’t know how to ask. Love it! 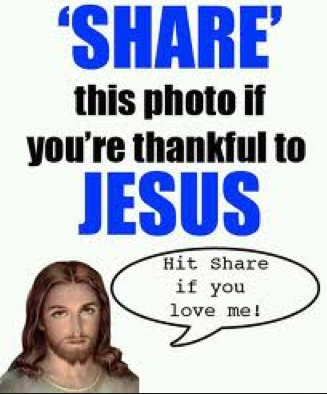 I get so tired of those spam-memes that insist that if you don’t click Like/Share/Retweet/Whatever-the-idiom-is-for-the-site … then you’re a cruel/hateful/unpatriotic person who doesn’t love Jesus or something. I saw a cartoon like that once, and I wanted to post it in here but couldn’t find it. I know you can’t see me right now, but I’m giving your post a standing ovation. Blessings. Excellent! I wish I had written this very post. So much so that I’m going to attempt to re-blog it. I’ve never done that before, but this has been on my mind for awhile and I just couldn’t decide how to tactfully address it. Thank you. I have been wanting to write on this topic, but hadn’t yet decided how to tactfully do so. I wish I had written this post so much that I am re-blogging it with thanks to The New Authors Fellowship.